Preventing disease and injury among Hamilton County residents is a primary goal for staff at Hamilton County Public Health (HCPH). The Division of Epidemiology and Assessment works to detect and help diagnose community health issues in Hamilton County that run the gamut from outbreaks of infectious disease to a high infant mortality rate. At Hamilton County Public Health, our epidemiologists conduct disease and injury surveillance through the ongoing collection, analysis, and reporting of public health data. This information is used to characterize the Who, What, When, Where, and Why of public health issues that are important to our community. Our epidemiologists conduct research to identify and investigate the risk factors associated with disease and injury in our community. The information generated from the Division of Epidemiology can be used for community planning, the detection of emerging health problems, program evaluation, the stimulation of local research, and to inform public health intervention. The Division of Epidemiology prides itself in being a rich source of public health data for our community, health care partners, and all other stakeholders. Ohio Administrative Code (3701-3-02, 3701-3-05 and 3701-3-12) requires cases of certain communicable or highly contagious diseases to be reported to local health departments. Examples of communicable diseases include salmonella, hepatitis, rabies, crypto, tetanus, chickenpox, whooping cough and more. Identification of a suspected or confirmed case of an infectious disease is the first step. This can be done by physicians, laboratories, school nurses, nurse practitioners, infection control practitioners, and others. Suspected cases are to be reported so that measures to protect contacts of the case can be planned and instituted as soon as the disease is confirmed. This is especially important in diseases which are easily spread, such as measles, or for which exposure is particularly hazardous, such as meningococcal disease. Case reporting to a local health jurisdiction, and subsequently to the state, allows identification of related cases, or outbreaks, which might not be apparent to a practitioner seeing only one or two affected patients. Review the Ohio Infectious Disease Control Manual for specific reporting information and educational materials about the suspected disease. Confirm each diagnosis and original source of the disease. Look for potential common modes of transmission among affected persons. Provide affected persons and the public with information about the disease including: symptoms, how diagnosis is confirmed, how the disease is spread, and prevention measures. In some cases, communicable disease staff works with other public health staff to control or stop an outbreak. For example, when restaurants or day care centers are involved, communicable disease investigators and environmental health staff work together to develop a coordinated response. For more information, please contact our staff at (513) 946-7887 or (513) 946-7849. Diarrheal illnesses are caused by bacteria, parasites and viruses. Primary symptoms can include diarrhea, fever and vomiting. Such illnesses can be especially harmful to children and are often spread –by bacteria that pass from the stool or soiled fingers of one person to the mouth of another person. This happens when basic hygiene and proper hand washing habits are not used. Frequent and thorough hand washing – especially among children – is the number one thing individuals can to do prevent the spread of disease. As outlined by the Ohio Administrative Code, child care center workers or attendees with diarrhea are not permitted to attend the child care center (see OAC 3701-3-13, I). A child with diarrhea should be referred to medical care for testing. Ask parents about any recent history of diarrhea prior to accepting all new children. Wash hands using warm water and soap for at least 20 seconds (sing Happy Birthday twice). Hands must be washed upon entering the center, after using the bathroom, before eating meals and snacks, and before preparing meals. Change diapers in designated area only. Assign specific, gloved staff person to diaper changing. This person cannot handle food. Wash and sanitize diaper changing area after each diaper change. Wash hands and change gloves after each diaper change. Put soiled diapers and gloves in plastic bag. Dispose of them without contaminating your hands. Wash, sanitize and rinse mouthed toys after a child has played with it. Wash and sanitize counter tops, tables and chairs before preparing/eating food. Also, be sure to have updated exclusion policies and contact information of parents readily available. This will help facilitate management of diseases, should they occur in your center. For additional information, refer to your copy of the Communicable Disease Curriculum for Child Care Providers. This handbook contains a fact sheet on diarrheal illnesses in children. It can be viewed or printed here. 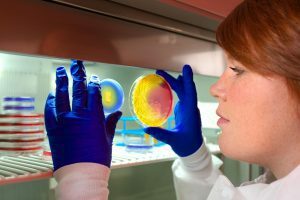 MRSA (pronounced MER-sa), is the abbreviation for Methicillin-resistant Staphylococcus aureus, one of several types of bacteria that can cause serious health complications and may be difficult to treat. Common signs of a skin infection include redness, warmth, swelling and tenderness. Often a MRSA infection will look like a spider bite, boil, abscess or pimple. If left untreated, it could progress into a more serious illness. In outbreak situations, the environment has not played a significant role in the transmission of MRSA. Studies in health care and community settings show skin-to-skin contact, direct contact with the infected wound drainage or contact with contaminated surfaces or things such as sports equipment as the likely source of transmission. MRSA skin infections are not spread through the air. Antibiotics are typically used to fight bacterial infections, but some, such as MRSA, have grown resistant to this medicine. There are things you can do to reduce the risk of infection. The links below include information from ODH and CDC that may be helpful in reducing your risk. For additional information, click on the links below. Epidemiologists and disease investigators monitor the incidence of communicable diseases in Hamilton County and investigate/mitigate multiple outbreaks each year that affect our residents. Communicable diseases are illnesses that are caused by bacteria, viruses, fungi and parasites. Tracking these diseases allows state and local health departments to detect unusual incidences of disease, investigate sources of infection, implement effective control measures, and develop programs and policies to prevent the spread of disease. Weekly and monthly surveillance reports are circulated among stakeholders such as infection control practitioners in our local hospitals. Moreover, epidemiologists track and investigate unusual increases in emergency department registrations as well as school absenteeism in an effort to understand the impact of disease on our local population and to promote early detection of outbreaks. The Community AHEAD program tool (see below) also provides access to local health statistics. Hamilton County Public Health is part of a county-wide initiative to improve maternal and infant health and to reduce infant mortality— a significant, troubling problem in Hamilton County. In order to take effective actions to improve the health and safety of infants and children in our community, it is essential to identify, describe and monitor these problems and the populations at risk. Our epidemiologists work to monitor and report the frequency of infant deaths and the associated risk factors such as pre-term birth; visit our reports page to review the most recent monthly reports (click here). Maternal and Infant Health data is also available through our Community AHEAD program tool (below). Our division also provides analytical services to support the shared objectives of other agencies; please see the Child Fatality Review Reports (click here) and our Maternal and Newborn Health and Infant Mortality pages. The HCISS is a collaborative surveillance effort led by Hamilton County Public Health and supported by the following local partners: The Christ Hospital, Cincinnati Children’s Hospital Medical Center, Deaconess Hospital, the Office of the Hamilton County Coroner, Mercy Health Partners, TriHealth, UC Health, and the Greater Cincinnati Health Council. Injury is a significant, preventable problem in Hamilton County. Injury data are collected and analyzed each year; local injury assessments and statistics can be located on our reports page (click here) and within the Community AHEAD program tool (below), respectively. Hamilton County Public Health issues birth and death certificates (click here for more information on birth and death certificates). Our epidemiologists manage the data behind the birth and death certificates. The vital statistics data contain valuable information that can be used to calculate statistics such as cause-specific death rates and the rates of adverse birth outcomes (e.g., pre-term birth, infant mortality). Birth and death data have been loaded into our Community AHEAD program tool. Please see our community health profiles on our reports page to access community-specific reports on a wide range of health issues in Hamilton County (click here). The Community AHEAD Program is a new effort to share public health data with the community. The goal of this program is to use available data to improve our understanding of the health issues that affect our local communities. The first step in advancing the health status of our county is to understand local trends associated with disease and injury. Click here to be taken to our Community AHEAD tool! Still can’t locate the local health data you need? Please contact Hamilton County Public Health (513-946-7800) for consultation. The HPCH Division of Epidemiology and Assessment requires the completion of a Data Request Form (select to download). Once completed, the form must be faxed to 513-946-7943, mailed to HCPH (Attention to Epidemiology), or e-mailed to David.Carlson@Hamilton-co.org. All requesters are strongly encouraged contact the Division of Epidemiology and Assessment prior to submitting a request; several factors such as the scope and type of a request must be reviewed prior to approval of all data requests. Please review the Ohio Department of Health Data Disclosure Policy.